Dan the Pixar Fan: Monsters Inc: Sulley "Dorbz"
If you've been a follower of my blog for a while, you might know that I'm all about the current vinyl collectible craze right now. From the old school "Mighty Muggs" to Funkos ("POP! 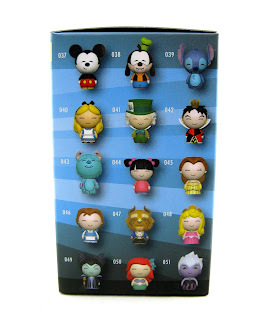 ", Mystery Minis, "BLOX") to Vinylmations, etc...I love them all! Well, yet another line of stylized vinyl figures has surfaced and is growing in popularity: "Dorbz" by Vinyl Sugar! Here we have the adorable Sulley from Monsters Inc.; #43 of their Disney Series 1. This one (along with Boo, who I'll be showing here tomorrow) were just released. Take a look at some of the other characters in this collection on the side of the box! So far, Sulley and Boo are the only Pixar characters, but I'm so hoping for more soon! These little guys are so great. Dorbz stand at about 3" tall and feature one point of articulation (the head can rotate a full 360 degrees). They retail for around $7.99, but that depends on where you purchase them. It was recently announced that Dorbz (along with other Vinyl Sugar collectibles) will be now part of the Funko family (it seems as though Vinyl Sugar was bought out by Funko?). Either way, from now on, Dorbz will be carrying the Funko name! That's pretty neat. 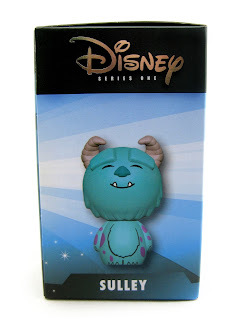 I found Sulley and Boo at Game Stop this past week, but Dorbz in general can be found at other retailers such as Amazon, Hot Topic, Barnes and Noble, etc.. Be sure to use the direct link below if interested! If you're a Monsters Inc. fan and/or collector, this is a must. Perfect for both kids and adults! Labels: Funko Dorbz, Monsters Inc.